8요일에 눈이 밝아진다는 12명의 시각예술 작가들이 참여하는 메타-레지던시 프로젝트입니다. 예술 레지던시 프로그램으로서는 극단적으로 짧은 8일 동안 진행되며, 프로젝트 공간으로서 광주라는 물리적 공간과 웹이라는 가상공간에 동등한 중요도를 둡니다. 8일은 모두에게 다르게 흘러갑니다. 이 제한적인 시간은 작업 자체의 생명을 강조해 보여주는 요소입니다. 작업은 8요일에 눈이 밝아진다(이하 8요일)에 특정하게 제작돼 시작, 완결되기도 하며 8요일 이전부터 진행 중이던 작업이 이어지기도 하는데,어느 경우이건, 이후에도 8요일 작업의 생명은 반드시 이어집니다. 프로젝트 중 매일의 작업과정은 물론이고 5월 2일 전시 후에도 8요일로 인해 유발된 작업, 사건,행사, 관계 등의 궤적을 계속 기록, 공개하는 것은 그 점을 계속 보여주기 위해서입니다. 공간에 대한 작가들의 인식과 해석은 각기 다르게 드러납니다. 작가들은 고정적, 물리적 공간에 아랑곳없이 당시 속한 공간에 유동적으로 대응하거나, 구 고시원 방을 개조한 레지던시라는 상황에 처한 개인적 느낌에 반응합니다. 또, 광주라는 도시에 주의를 기울이기도 하는 반면 물리적 공간을 주요한 조건으로 고려하지 않기도 합니다. 여기에 웹이 만들어내는 결도 더해집니다. 5월 2일에 광주 바림에서 열리는 전시 외에도 전시 이전부터 이후까지 열려있는 웹 창구들은 보이고자 하는 방식, 보는 방식에 대한 문제를 생각하게 합니다. 작가들은 8요일의 요구에 의해 전시라는 확정적인 매체가 아닌 방식으로 작업 혹은 작업과정을 다양한 방식으로 드러냅니다. 관람자들 또한 플랫폼 특성에 따라 정보들을 임의적으로 재구성하며 전시와는 다른 방식으로 시각예술 작업을 접합니다. 2015년 한국의 시각예술 작가들이 살아가고, 작업하며, 시간과 공간을 받아들이고 반응하는 양상을 8요일을 통해 볼 수 있습니다. 우연히 주어진, 광주와 웹에서의 8일과 그 이후의 프로젝트. 8요일에 눈이 밝아진다는 한시적이고 연속적입니다. 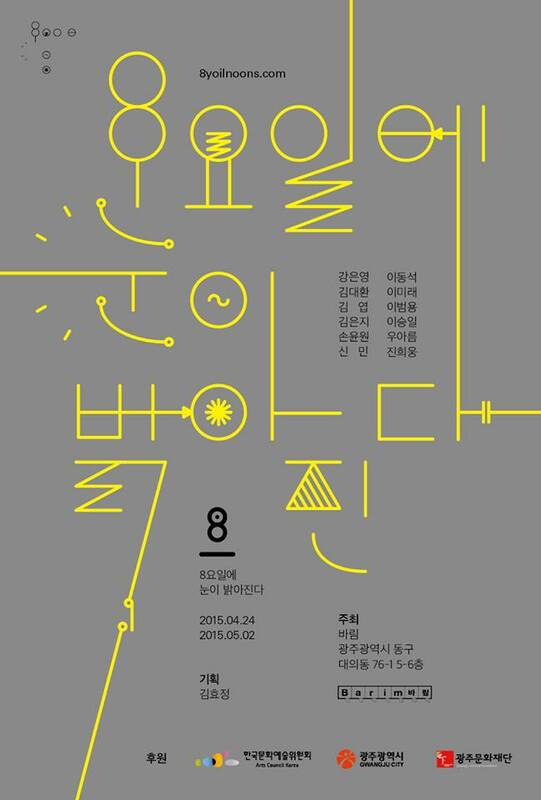 8yoil noons (which literally means “eye-opening on the 8th day“) is a meta-residence project by 12 visual artists. Extremely short, 8 days are given for the residence artists, using two equally important project spaces: Gwangju as physical space, and the web as virtual space. 8 days go by differently for everyone. This limited time is an emphasizing element of the life of works. The 8 days, in which all the artists gather in one space and intensively work, function as the time which passes by the existence of the work. Some of the works are produced and finished particularly for the project, and some others are the continuations of their previous works. Yet, whichever it is, the life of the 8yoil noons works certainly continues: which is shown through the documentation and publication of the daily working process and traces of any induced works, incidents, events, and relations after the exhibition on May 2. The awareness and interpretation of the artists toward space are revealed differently. Some flexibly respond to the space apart from its steady and physical space, or some personally respond to the situation of the renovated Goshiwon residence program. Some focus on Gwangju as a city, and others do not consider any physical spatial conditions. The web adds another layer to it. Not only the exhibition on May 2 at Barim, Gwangju, but also for during days before and after the exhibition, the web communicates to the audience, and it provokes us to think about the way we show and the way we see. The artists are asked to answer to 8yoil noons in a different way than a definite medium such as an exhibition, and the audience also encounters visual arts works different from the exhibition as they voluntarily reconstruct the information based on the characteristic of the platform. 8yoil noons brings aspects of Korean visual artists in 2015 of their living, working, accepting time and space, and responses to it. A coincidently given project for 8 days and later, in Gwangju and the web. 8yoil noons is temporary and continual. 이 글은 news, residency 카테고리에 분류되었고 exhibition, RESIDENCY 태그가 있습니다. 고유주소 북마크.